If you notice hard water stains building up on shower doors or other moist areas, there is an easy way to eliminate this problem. Keeping these surfaces dry will actually cut down on the amount of mineral deposits that accumulate on wet surfaces. Even though areas such as showers and sinks come in contact with water every day, you shouldn’t let hard water sit long enough to dry. After an area becomes wet, make sure to dry all surfaces as soon as possible. Wipe sinks dry after use and keep counter tops dry. Many homeowners also find that using a squeegee or a towel to dry shower doors can be very helpful. Many of the store-bought cleaning agents that are recommended for hard water stains contain harsh chemicals. For families with children and pets, this can be dangerous and unhealthy. Luckily, if you do end up with hard water stains, there are a few more gentle solutions. Use a few cups of white vinegar to remove hard water buildup in toilets. After treating with vinegar, the stains should come out with a good scrubbing. Lemon juice is another popular method for removing hard water stains. Use plain lemon juice or combine with vinegar and water to create a powerful, yet safe way to remove stains in your home. Spray the solution on tubs, faucets, shower doors, or sinks and let stand for 15-20 minutes. The stains should wipe away easily. This same solution can be used to prevent staining, when sprayed on problem areas. We all know that prevention is the best medicine, and this is very true when it comes to keeping your home clean. 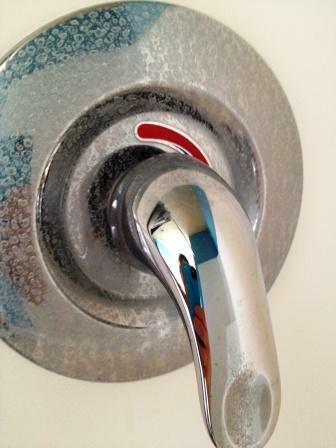 Hard water stains worsen over time as more and more minerals dry and accumulate on your home’s surfaces. The longer you wait to clean, the more difficult and stubborn these stains will become. If you notice certain areas are prone to staining, make preventative cleaning part of your routine. At least one day a week, spray surfaces with the vinegar or lemon juice solution before you see signs of staining. Let the solution work for a few minutes and wipe clean. Treat your toilet with vinegar at least once a month. These preventative measures will help you keep your home looking its best. The most straightforward method of preventing unwanted hard water stains is to simply avoid hard water altogether. A water softener removes excess minerals in your water. The water softener will ensure that these minerals are removed before they even have a chance to reach your faucets and appliances. You can feel confident your family will always have soft water, which comes with many other benefits. In addition to avoiding hard water staining, you won’t have to worry about washing your clothes or yourself with hard water. With so much to do around the house, the last thing you need is one more chore. Preventative cleaning and mineral-fighting agents can help combat problems with hard water stains, but they won’t help you completely avoid the problem. Using a water softener is the best choice for actually solving the problem. With more than 30 water softener options to choose from, Schultz Soft Water has a softener that will work for your family’s needs.